You sound like my kids JJ (without the expletives-at least within my earshot). I have a theory: I’ve put the guitar in a prominent place, and whenever I walk by I do a quick: A, D, A, Em, D, A. Which is my song. I figure at some point my fingers will work and I can add in the proper strumming. Maybe. 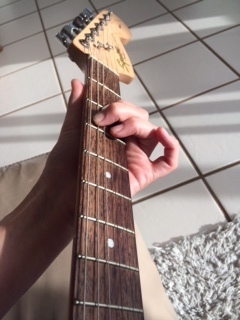 So far my fave chord is Em. How funny, I have a favourite chord. Who even am I this week? I learnt singing as an adult, took it up 3 years ago. It has to be the most difficult skill I’ve ever learnt but practice got me through. Great idea teaching the kids at an early age. Did you really? I’d love to do that. Although I think I’d be hard pressed to find a singing teacher who would have me! Yeah I did and I still do it. I’m no expert but I’ve certainly come along way and can notice the difference. You can do it too, I’m sure you can find a teacher. Give it a go, it’ll take practice but it’ll be worth it.